You all may have noticed that things look a little different over here at Frugal Foodie Mama over the past week. :) A few months ago, I feel in love with Always in Bluhm Designs when I happened to discover Theresa & her talents thanks to an online auction on Instagram. I found myself clicking over to her site often, oohing & ahhing over her fresh & pretty designs. Some of you all may not know this, but I happen to be one of the few bloggers still using the Blogger platform. Most bloggers have already migrated over to WordPress. Call me stubborn or "old-fashioned", but I have dug in and decided to stay with Blogger. I figure if it isn't broke then why fix it? ;) And lucky for me that I decided to stick with Blogger because that is all that Theresa does- gorgeous and clean designs for Blogger blogs. If you happen to be on Blogger and have been pondering a new site design or even just a few design updates, I can't recommend Always in Bluhm Designs enough, friends. I am in love with my new design from Theresa, and she was so easy to work with & included me in each and every step of the process. I also loved how flexible her design packages are! I thought about a new full-on site design, but decided to piece together my own design package. 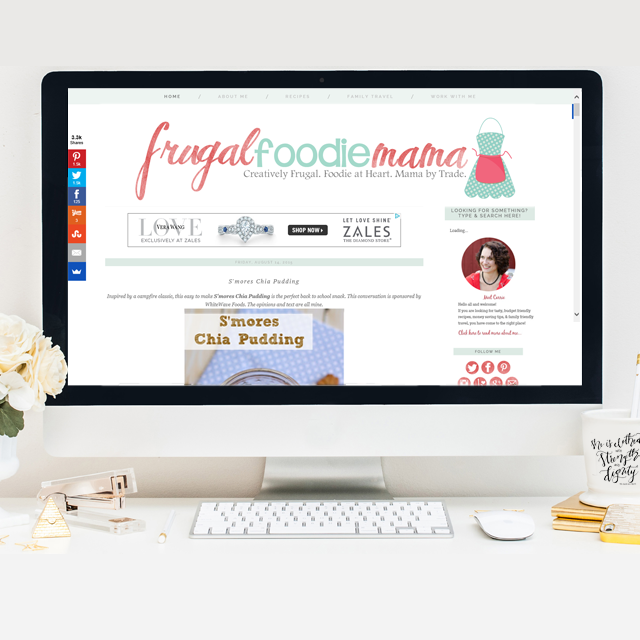 So what did Frugal Foodie Mama have freshened up? For starters she redesigned the header (above) & my social media follow buttons (over there on the right sidebar), she cleaned up and consolidated my sidebar, created new post & email signatures (below), created a new cover for my Facebook page (see that here), gave the site a new favicon (that little apron you see in your browser's tab), completely redesigned the Family Travel page (click over, folks- it is SO pretty! ), and I finally have share buttons for each post (over there to the left). My lack of post share buttons had been in thorn in my side for a while now. Mainly because people (aka, recipe lovers) are really starting to get into and use Yummly for saving and sharing their favorite recipes online, and I didn't have a dedicated Yum button on my blog posts up until the end of last week. Haven't heard of Yummly before? Well, let me give you a quick run-down of what it is. With over 15 million users worldwide, Yummly is quickly becoming the source for online recipe searches & recipe recommendations. Once you have started an account on Yummly, you can fill your digital recipe box with your favorite recipes from around the web (ahem- and from Frugal Foodie Mama ;) ) and from there you can create smart shopping lists for your weekly grocery shopping. Yumming recipes is easy, peasy. You can either use the Yum button (over there to the left) or you can install the Yum bookmarklet and then Yum & save recipes from any site you would like whether they have a Yum button installed or not. And you can Yum recipes right from your desktop or by downloading the Yummly app for iPhone, iPad, and Android. What do you think of the blog's new look? Follow Carrie (Frugal Foodie Mama)'s board Frugal Foodie Mama Recipes on Pinterest.